September 07, 2018 at 12:05 am. 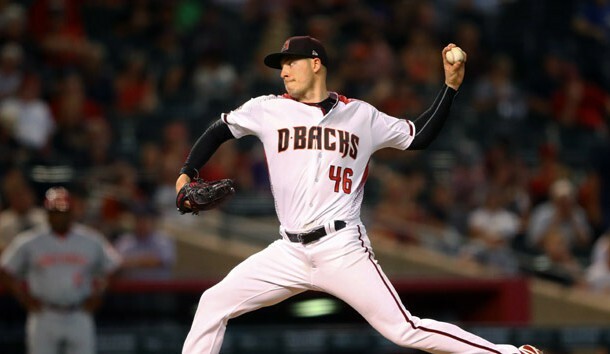 TEMPE, Ariz. — Arizona Diamondbacks left-hander Patrick Corbin picked a great year to have a great year. Corbin will be one of the most coveted free agents in the majors this winter, and entering the market after a career year is never a bad plan. He will bring a 10-5 record and a 3.06 ERA into his 29th start of the season Friday in the second game of a four-game series against Atlanta at Chase Field. The Braves will counter with right-hander Kevin Gausman (9-9, 3.78 ERA). Atlanta won the series opener, although it was not easy. The Braves took a 4-0 lead in the fourth inning, lost a two-run lead in the bottom of the ninth on a Paul Goldschmidt game-tying homer, and rallied for a 7-6, 10-inning victory to avoid a second straight difficult loss. The Braves lost a six-run lead in the eighth and a one-run lead in the ninth in a 9-8 loss to Boston at home on Wednesday. “I tell you what it speaks to, the makeup of that team in there,” Atlanta manager Brian Snitker said, nodding toward the clubhouse. The Braves increased their NL East lead to 3 1/2 games while the Diamondbacks fell 2 1/2 games behind NL West-leading Colorado. The Diamondbacks have lost five of six and will look to Corbin to turn it around. Corbin, 29, is third in the NL with a career-high 214 strikeouts, trailing only Max Scherzer and Jacob deGrom. Corbin is averaging 11.1 strikeouts per nine innings, second in the NL, and his 5.2-to-1 ratio of strikeouts to walks is third. About all he has lacked this season is consistent run support. Those numbers probably would have translated into more victories had he received more than an average of 4.04 runs per start. Corbin has turned it up down the stretch, having given up as many as four runs only twice in his last 13 starts. Nine of those were quality starts. Corbin was chosen to make his first Opening Day start this season, threw a one-hit shutout in his fourth start and kept rolling. He recently tied Miguel Batista’s team record for starters by going 11 consecutive starts without giving up a home run. Arizona manager Torey Lovullo said he was impressed by the offseason commitment Corbin showed after going 14-13 with 4.03 ERA in 2017. “It’s not a surprise to me — it is what he had in him,” Arizona manager Torey Lovullo said of Corbin’s year. “The type of offseason, work-wise, that he had was leading me to believe he was prepared physically for the season. Emotionally is always a wild card. You just don’t know where they are going from a mindset standpoint. But fundamentally I knew that he was going to be locked in. Gausman, the fourth player taken in the 2012 draft, has pitched like it since joining the Braves in a July 31 deadline deal with Baltimore, a trade that also brought reliever Darren O’Day in exchange for a package of four minor league players and international bonus pool money. After a few minor tweaks to his approach, Gausman has posted a 4-1 record and a 1.66 ERA is six starts for Atlanta, including four quality starts. He has given up as many as three earned runs only once. In 38 innings, he has given up 26 hits and has 26 strikeouts while holding opponents to a .190 batting average. Gausman was 5-8 with a 4.43 ERA in 21 starts with the Orioles, where he spent his previous five seasons. The Braves control him for one more year before possible free agency. Gausman has never faced the Diamondbacks. Corbin has made five quality starts in his last six appearances, and he threw five scoreless innings against the Dodgers in the one game he did not, receiving a no-decision in a 3-2 loss last Saturday in Los Angeles. He had 48 strikeouts against four walks in that span. Corbin faced Atlanta in their first series this season, giving up six hits and four runs in six innings of a 5-1 loss on July 15, the final game before the All-Star break. Corbin was named to the NL All-Star team but did not pitch in the game. He is 4-1 with a 1.69 ERA in eight career appearances (six starts) against Atlanta. That is Corbin’s lowest ERA against any opponent he has faced more than once.